1.Melt the butter and let it cool down. 2.Beat eggs, sugar and buttermilk into the melted butter. 3.Sift the self-raising flour, baking powder and salt together. 4.Add All-Bran, uncooked oats and pecan nuts. 5.Add wet ingredients to dry ingredients. 6.Ladle in a large oven pan (330 x 280 mm), lined with foil or baking paper. 7.Bake for 25 minutes in an oven of 200°C. Reduce the heat to 180°C for another 25 minutes or more, until golden brown. 8.Cool slightly before turning the tin out and let it cool down. 9.Slice into slices and then cut into fingers. Place on a drying rack and dry in oven at 80°C until the rusks are dry, crunchy and brittle. 10.After they cooled down, place in an air tight container. Spray or butter a deep oven pan. Bake for about 45 min at 180° Let it cool off complete and then cut it in squares. Let it dry out in the oven at 100° Don't let it burn!! Sift flour, baking powder, bicarbonate of soda, cream of tartar and salt together. Rub in margarine with fingertips until it resembles fine breadcrumbs. Add sugar and aniseed. Whisk eggs, milk and buttermilk together. Add to dry ingredients and mix well to a soft dough. Add more milk if required. Shape into balls and place into a large greased oven pan of about 24 x 34 cm. Bake in a preheated oven at 180 °C for about 50 minutes. Turn out onto wire racks to cool slightly. Break open while still warm and leave to cool further. Dry out in a cool oven at 50 °C overnight. Store in an airtight container. 500 ml (2 cups) Huletts SunSweet Brown Sugar . Melt the butter, oil and sugar in a saucepan and allow to cool. Beat well until thick. Beat in the eggs one by one, then beat in the buttermilk. Add all the dry ingredients and stir until blended. Pour the mixture into two loaf tins or one large roasting tin lined with oiled greaseproof paper. Bake at 180°C for 1 hour. Turn out, and leave to cool. Cut into rusks. Allow to dry overnight in the oven warmer draw or reduce the oven temperature to 100°C and leave for 4–6 hours to dry completely. Store in an airtight container. 1. Preheat the oven to 425∞F/220C and butter a 9" cake pan. 2. In a medium bowl, combine flour, baking powder, baking soda, sugar, kosher salt, and buttermilk powder. Mix with a whisk to combine and aerate the flour, about a minute. 3. Remove one cup of the flour mixture and pour into a deep plate or pie pan. Set aside. 4. Reserve one tablespoon of butter. Use a pastry blender, two knives, or your hands to work the rest of the cubes of butter into the remaining flour mixture in the bowl until it looks like coarse meal or graham cracker crumbs. 5. Add one cup of water to the mixture and continue to stir the dough with a fork to mix. It should be wet and resemble cottage cheese. Do not overmix. 6. Butter or spray an ice cream scoop with cooking spray, then use it to scoop a wet ball of dough. Drop the ball into the pie pan with the remaining cup of flour and gently roll and shape it in the flour. Lightly shake off the excess flour and place the ball of dough in the buttered cake pan. 7. Repeat until you've used all of the dough, placing 9 dough balls around the edge of the cake pan and one in the center. The biscuits should touch. 8. Bake for 20 minutes, or until golden brown. Melt the remaining tablespoon of butter and brush over the biscuits as you remove them from the oven. 9. Allow to cool for a few minutes, then serve immediately with warmed preserves or sausage gravy. If you have fresh buttermilk on hand, substitute 1 cup for the buttermilk powder and water used in the recipe. 5. Mix ti a firm doug. .
6. Pinch off golf balk siced pieces of doug and press tightly into rectangular shape approx 2 cm thick. 7. Place close together in two greased loaf pans (30 × 36 × 7 cm) and brush the sides of each row of balls with oil so that the rusks will break apart easily after being baked. 8. Brush with diluted milk. 9. Bake at 240○C for 10 min and reduse to heat to 190○C and bake for further 50 min. 10. Turn out on cooking rack and break into three places so that the rusks will cool more quickly. Ek het hom dubbeld aangemaak en in 2 panne met die drukker gebak en dit is heerlik verby! Add the remaining ingredients and stir well to make a fairly firm dough. Bake in preheated oven 180C for 45 minute, then remove from the oven and allow to cool. 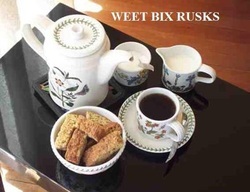 Makes: 15 – 20 rusks. Sift the flour, cinnamon and salt. Make a well in the dry ingredients and add the creamed butter and sugar. Mix well then add the vanilla, eggs and yoghurt. Mix until the dough comes together and press the mixture into a 5 cm deep baking tin. Remove from the oven then turn out onto a wire rack and cool. Cut into squares then return to a 70°C oven to dry out for 2 hours or overnight. Put flour, baking powder and salt into a bowl. Add the butter and rub it in until the mixture resembles breadcrumbs. Mix in the sugar, lemon rind, poppy seeds and cranberries. Combine the eggs and buttermilk and mix well. Add to the dry ingredients and mix to form a stiff dough. Press the mixture into a well-greased 30x40cm deep roasting pan. Bake at 180°C for 30-40 minutes or until a skewer inserted into the middle of the tray comes out clean. Remove and cool in the pan for 10 minutes before turning out on to a cooling rack. Cool completely. Cut into the size you prefer and pack on to a baking tray. Reduce the oven temperature to 50°C and return the rusks to dry out overnight. Mix dry ing. well... mix margerine, milk, buttermilk and eggs well...add butter mix to dry mix and mix to a soft dough. Grease a 25x25x7cm square tin. Bake. Allow to cool. Turn out and cool completely. Slice into dipping pieces. Dry out in an 100C Oven till crisp and dry. Mix all of the above ingredients except for flour together. Wait 3 minutes, then mix flour in until all is combined. Pour mixture in a glass tray and bake for 1/2 hour. After 1/2 an hour is done, take tray out and cut the cake rusk into desired pieces. 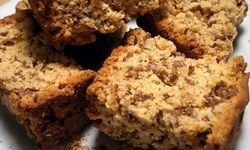 Spread pieces out on a black flat oven tray or cookie tray. Heat oven to 200 degrees and bake for 2 hours. Preheat the oven to 400 F. degrees. Proof the yeast in 1/2 cup of the lukewarm milk with 1 teaspoon of the sugar. When you have a yeast sponge, add the rest of the milk, sugar, and 1/2 cup plus 2 Tbs. soft butter. Stir in the flour, cup by cup, until you have a dough that you can knead. Work until smooth and shiny, then place in a large buttered bowl, cover with a towel and put in a warm place for about 1 hour or until doubled in bulk. Take the dough out onto a lightly floured work surface, knead for a few minutes and roll into ropes, about 2 inches thick. Bread off pieces, about the size of an egg, and shape into little round buns. Place these on buttered baking sheets, cover with a towel and let rise until doubled in bulk, about 45 minutes. Bake in the oven until they are pale gold, about 15 to 20 minutes. After they have cooled, use a big fork to slice the top half off each bun. Place both tops and bottoms on a baking sheet; they can be rather close together. Bake in a 400 degrees oven until light brown, about 10 to 15 minutes. Turn off the heat and let them get crisp. These will keep crisp and fresh for a long time. If they do get soggy, put them back in a low oven and let them crisp again. 60 Rusks. Do not Freeze. If you don’t feel well or can’t go to sleep, eat these with some warm milk. Dip them in if nobody’s looking. So good and so soothing. Mix the wet mixture into the dry mixture...mix well. baking - Bake in 160 or 170C oven for 1 hour. Remove and slice through again. 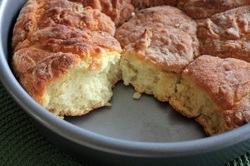 This is an easy quick bread that is so good straight from the oven spread with honey butter. In a large bowl using a whisk mix together the whole wheat flour, all-purpose flour, oats, salt, and baking powder. In a smaller bowl whisk together the buttermilk, egg, oil and honey. Combine the two bowls and mix well with spoon. Turn out onto a wheat floured board and knead, adding flour until you have a dough. Spray a 9 x 4 bread pan with cooking spray and add dough. Bake in preheated 350 degree oven for 40 – 45 minutes. Remove from pan and slice and enjoy with honey butter spread. Makes one loaf. Remove paper from margarine and put in large microwave bowl. Microwave about 12 seconds to soften the butter. Add the honey and beat with electric mixer about a minute until smooth. Enjoy on this bread, biscuits, waffles, and pancakes. Store in refrigerator. Keeps well. Pour flour into a large bowl and add salt and aniseed. Heat milk and butter to a boil and allow to cool to lukewarm. Add eggs and sugar, whisk and add to flour. Add the grape must , knead lightly and then knead well for about 15-20 minutes, or until the dough is smooth and elastic and no longer sticks to your hands. Francina’s tip: Keep an extra bowl of flour and a cup of must next to you while you knee. If dough is too sticky, sprinkle a little flour. If it seems too dry, wet your hands with wine and knee further. Cover bowl with a cloth and leave to rise in a warm place overnight. Preheat the oven to 180 ° C. Knead dough the next morning. Brush a little melted butter on your hands and roll dough into tennis ball-sized orbs. Pack against each other in breadpans which you have treated with non-stick spray and leave pans in a warm place to allow dough tp have its second rising. Once the pans are almost full, place mosbolletjies in the oven and reduce oven temperature to 140 ° C. Bake for 40-60 minutes, until golden brown and cooked through. Brush with sugar water and turn out onto wire racks. Eat buns freshly smeared with butter or dry it out for mosbeskuit. Deliver three large loaves with 12-14 balls in each. Let the dough rise for about 6 hours in a warm place, or until it is three times the original size. On a cold day it might take longer, on a warm day it will be quicker. Pre-heat oven to 180 C and grease a large baking dish before lining it with greaseproof paper – you could also use parchment paper to line the tray. Mix the self-raising flour, the coconut, the bran, the raisins and the chopped nuts and rub in the butter with the tips of your fingers. Those of you that don’t like raisins, try using chopped almonds or any other nut or dried fruit of your choice – just make sure that you use the same quantity. Whisk the eggs until they’re fluffy and then pour buttermilk and sunflower oil into the mixture before combining with the dry ingredients to make a soft dough. Place in the oven dish and cut into bite sized squares with a wet knife (if you have time, you could also shape pieces of dough into small buns & pack them into the dish or into a bread pan) and bake for about an hour until a skewer comes out clean. Break the rusks loose to separate them from one another and dry in the oven at around 60 C until they are dry. Slice the bread into slices and cut into fingers (or break pieces apart). 3. Add bran, nuts and seeds. Mix well. 4. Rub butter into the flour mixture. This is easier if cold butter is grated first. 5. Whisk eggs and sugar together. Add milk, lemon juice and oil to egg mixture and and mix well. 6. Add fluids to flour mixture and mix. 7. Spread mixture into the greased tin. 8. Bake for approximately an hour in an oven preheated to 180°C. Test with a skewer to ensure it is baked throughout before removing from the oven. 9. Cool slightly before turning the tin out. 10. Let it cool down, cut into slices, and then cut the slices into blocks. 11. Dry overnight in a cool oven at about 80°C. Ensure that they dried out completely. Preheat oven to 180 ºC (350 ºF). Grease three 22x12x7 cm loaf tins. 1. Whisk dry ingredients in a large mixing bowl. 2. Mix melted butter, buttermilk, vinegar and eggs thoroughly. 3. Add butter mixture to the dry ingredients and mix to a soft dough. Divide dough equally between the three loaf tins. 4. Bake for 45 minutes. 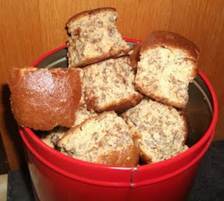 Allow rusks to cool in tins for 15 minutes. Turn out onto a wire cooler and allow to cool down completely. 5. 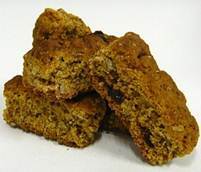 Break or slice rusks, place on baking trays and dry out in the oven, set at 100 ºC (200 ºF) until crisp and dry. Keep rusks in a cake tin. Grease two large loaf tins with butter. Combine all the dry ingredients and add the sugars, baking powder and salt. Add the oil, buttermilk and eggs to the melted butter and mix well. Place the mixture into the tins and bake for approximately 45 minutes until a skewer inserted comes out clean. Once the loaves are cool, cut them into fingers and arrange on a baking sheet and dry in the oven for 3 to 4 hours at 100°C.